The 4 Star Jubilane Guesthouse is nestled in the up-market community of Houghton Estate, a suburb of Johannesburg, South Africa. Jubilane Guesthouse is approximately a 2,900 square meter colonial-style home. We have seven bedrooms which are all individually and impeccably furnished. Three of our seven rooms are luxury en suite with a spa bath tub and shower for our guests’ indulgence. Our Imani suite is shower only, spacious and includes a lounge area with sliding glass doors which open up to a patio and look on to our tennis court. We also have three beautifully appointed standard rooms that share a separate shower/toilet and spa bath/toilet. All bedrooms are furnished with tea and coffee service, televisions, and clock radios. 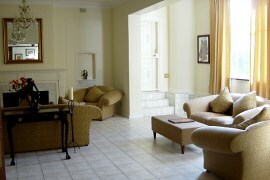 All televisions in the rooms have SABC stations as well as E-TV. Umoja (Room 2): Bed: Queen; Bath: En-suite shower / Jacuzzi; View: Private balcony, view of tennis court and garden. 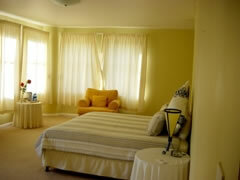 Kuumba (Room 3): Bed: Queen; Bath: En-suite shower / Jacuzzi; View: Private balcony, view of tennis court and garden. Jubilane Master Suite (Room 4): Bed: King; Bath: En-suite shower / Jacuzzi; View: Private balcony, view of garden. Kujichagulia (Room 7): Bed: Two single/twin beds; Bath: Separate shower / Spa bath. We serve our guests a different full breakfast daily to add some measure of variety to tempt our guests’ palate and add to their experience with us. Our television lounge has communal satellite television. Our luxury en suites are furnished with all of the above including DVD players, spacious walk-in closets and private balconies. In addition to enjoying the tranquility of our beautifully landscaped gardens our guests have full access to our salt water swimming pool and tennis court. Nearby points of interest include Rosebank Mall, Sandton City, Virgin Active Sports Facility, Houghton Golf Course, and Camelot Day Spa to name a few. 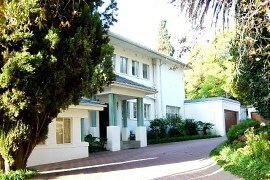 Jubilane Guesthouse is central to Johannesburg City Centre, numerous attractions, fabulous restaurants, and wonderful shops. Our competent staff will happily arrange tours, safaris, and make reservations at some of Joburg’s most famous restaurants. Finally, there are a host of venues to enjoy live theatre and music that include Globe Theatre at Gold Reef City, Civic and Market Theatres.